Last year, astronomers came across a planetary system called TRAPPIST-1, in the constellation Aquarius. It’s 40 light-years away; that’s about 370 trillion kilometres. The star at the centre of the system is only about 10% the size our sun, which makes it much easier for astronomers to view the 7 planets in orbit around it. These planets, at first glance, are very similar to Earth so over the last year astronomers have been scrutinising them in detail. Izzie Clarke heard how from Physicist Amaury Triaud from the University of Birmingham. Amaury - Our uncertainties were pretty large. What we did not know then was exactly what mass or what radius the planets were. We had an idea which allowed us to call the Earth-like but those properties are some of the most fundamental properties of a planet. The mass and the radius combined tell us about the density, and the density of a planet tells us about what it’s made of. For instance, a planet like the Earth has a certain density and it’s telling us that it has at the centre something made of iron and nickel, and on top is a big layer of rocks. So by comparing our planets to the Earth we can deduce what’s inside of them, how they were built, how different or similar they are to what we know. Amaury - What we measure always in relation to the star, we always measure the mass of a planet compared to the mass of the star; the radius of a planet compared to the radius of a star. If we get the star wrong, we get the planet wrong so we started by the most obvious - what is the star? Then we observed more as the planet passed in front of the star casting a shadow, and from how deep the shadow was we could measure more and more precisely how big the planets where. Then we tried to measure the mass, and we did that by measuring how early or late they came in front of this star which was a reflection of the forces that are acting between the planets themselves. Finally, we did a reconnaissance observation trying to find out if any of the planets had an atmosphere made of hydrogen or helium, something that would be similar to Uranus and Neptune. Mind you, we did not know whether those planets were really Earth-like or more like Neptune, but now we can say, with a fair amount of certainly, that they must be rocky. Izzie - Our own home, planet Earth, is also a rocky planet, so are Mercury, Venus and Mars. But how similar is this system compared to our own? Amaury - They're remarkably similar. When we had large uncertainties it meant that the planets could have any mass or radius within those uncertainties and it could have fallen anywhere. But we find out that TRAPPIST-1c is almost a copy of Venus. We find that TRAPPIST-1d looks really much like the Moon, and TRAPPIST-1e is by far the most interesting. It’s the most Earth-like planet we’ve identified so far with an inner composition that seems to match our planet. Izzie - So things are looking up with this fourth planet. It’s density is almost the same as Earth’s meaning that the inner cores must be similar. But what about those all important signs of water? Amaury - TRAPPIST-1e, at the moment, we still do not know. The amount of water that is on Earth is minute - 0.02% of the mass of the Earth is made of water. With this little amount it’s hard to measure it on TRAPPIST-1e. However, we do know that there is a lot of water around. 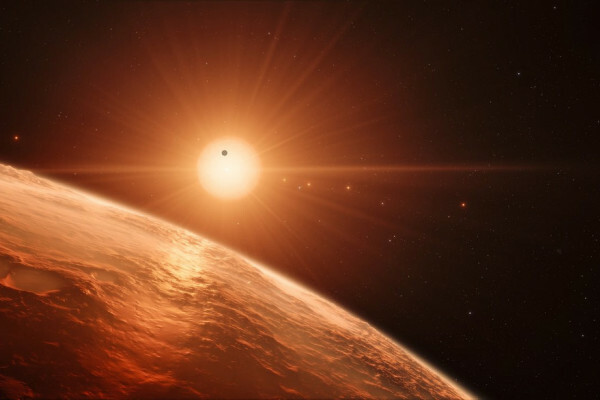 TRAPPIST-1b, the planet closest to the star seems to have a vast amount of volatiles. A volatile is something that is something that is not solid. If it is water then it would have 250 times more than the Earth has. Having a lot of water in a system bodes well for water on TRAPPIST-1e. Izzie - And, given ten years, Amaury suspects that we’ll even know what TRAPPIST-1e’s atmosphere will be like. So, could we humans ever set foot there? Amaury - With imagination only I think. They’re really close astronomically speaking, sadly, astronomical distances are astronomical in nature; they’re enormous, extremely vast. The system is 40 light years away and that may sound far to travel there, but it’s among the 300 closest stars to the Sun, so it’s close in astronomical terms. But, despite this proximity, I doubt that humanity will look at this world anytime soon. Although I do hope our discoveries inspire the next generation of physicists to find a way to bring us there.